George and Laverne Vallance had four stillborn babies (one set of twins) between 1922 and 1924 in Johnstown, Pennsylvania. They had no other children. 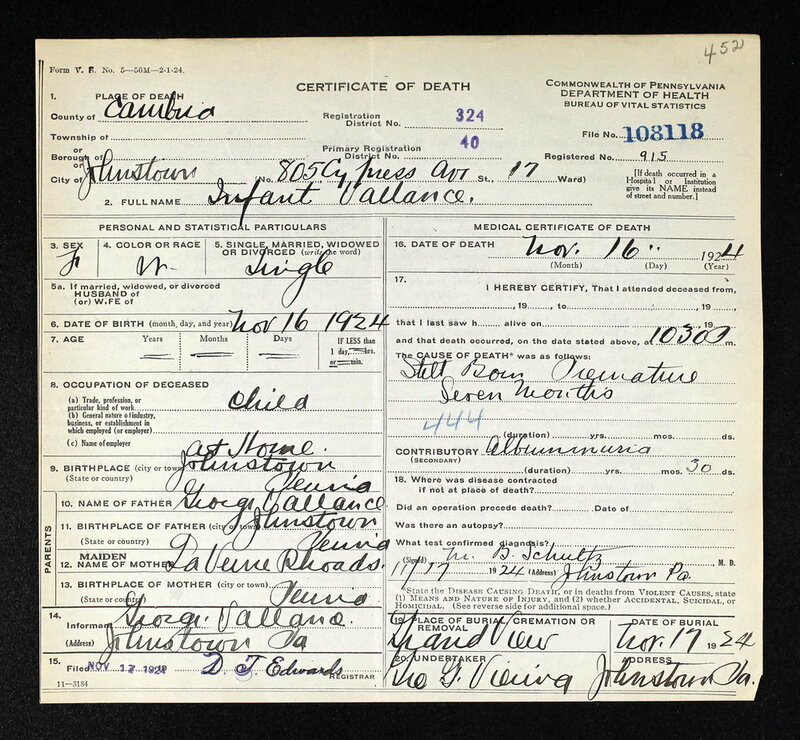 Born Laverne Rhoads (1899-1962), the Vallance babies' mother is my 1st cousin 3x removed. Her father, George Washington Rhoads (1868-1929) was a younger brother of my 2nd great grandfather, John M. Rhoads (1852-1919). Laverne was born less than one year before my great grandmother, Ida Rhoads Sears (1900-2002). The two were 1st cousins. It appears that they were close. Here are some photographs of Laverne from my great grandmother's photo album. Laverne Rhoads with her older and only sibling, Clarence O. Rhoads (1893-1964). Laverne's mother was a Jennie Kring (1871-1949). There were DOZENS of Kring and Rhoads family members living in and near Johnstown, Pennsylvania around this time. Jennie and Laverne's father, George, were two of at least 3 (that I know of) Kring/Rhoads marriages. I wrote about the Kring family here: Discovering My Connection to the Kring Family of Pennsylvania. In her astounding tome about the Kring Family ("From Sea to Shinning Sea: The Kring Family. 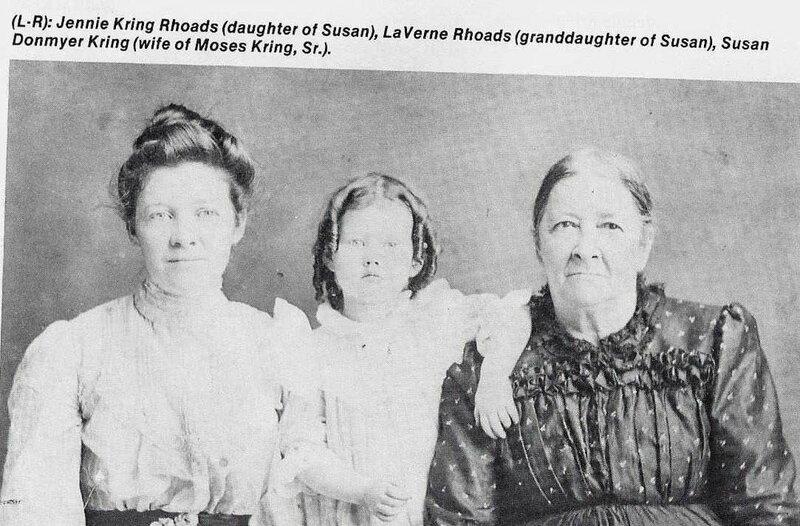 "), Sandra Kring Leonard included this photo of Laverne, her mother Jennie, and her grandmother, Susan Donmyer. Laverne married George Vallance (1894-1935) likely in 1921. Around the beginning of 1922 Laverne became pregnant with twins, a boy and a girl. On May 10th of that year, after five and a half months of pregnancy, the babies were stillborn. 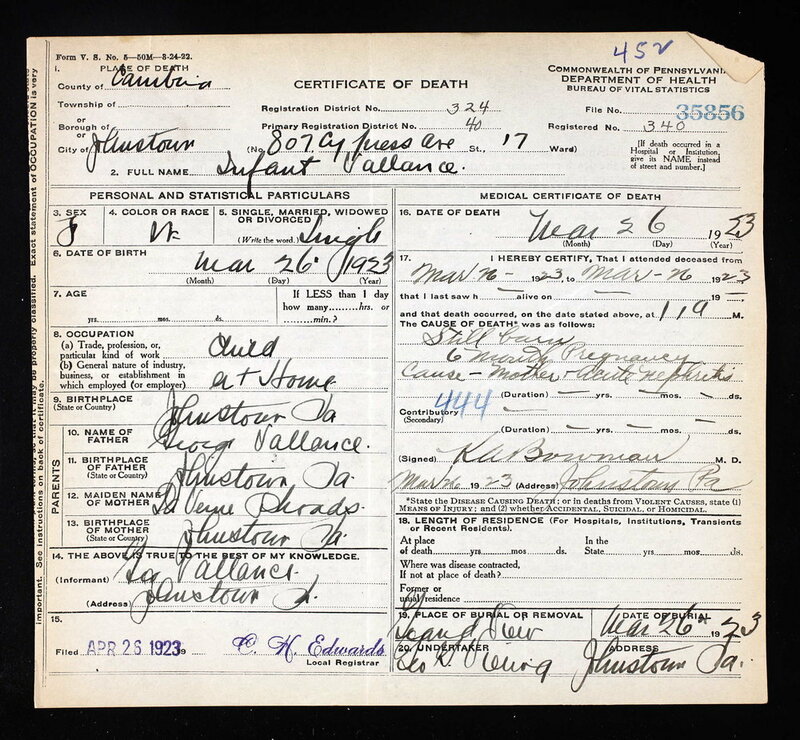 They were not named and their death certificates simply listed a male and a female "Infant Vallance". In the Fall that followed the loss of her twin babies, Laverne became pregnant again. 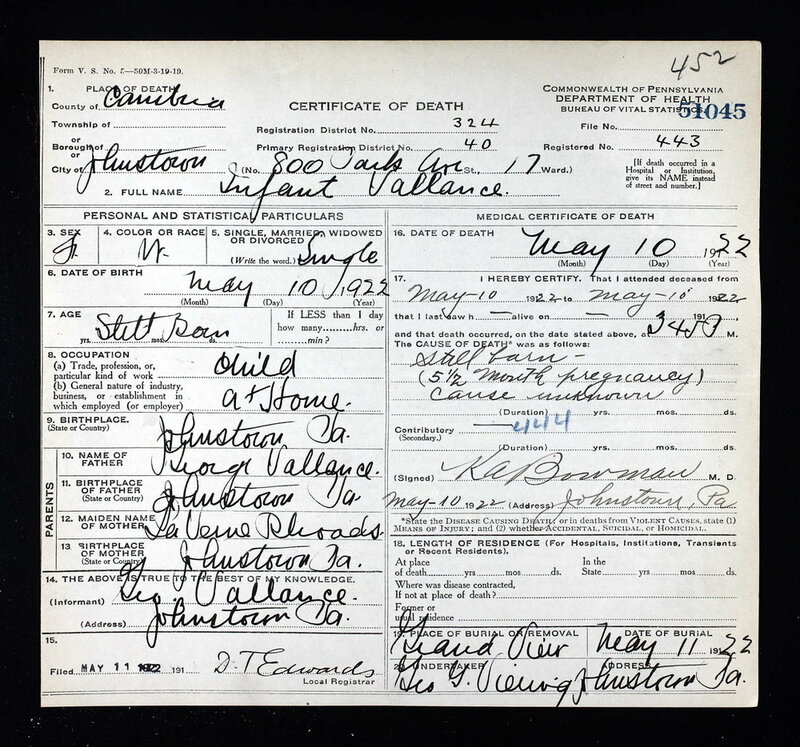 After a six month pregnancy, on March 26, 1923, she lost her third child, a stillborn "Infant Vallance" girl. Tragedy befell this couple one last time when, less than a year later on November 16, 1924, they would lose another infant girl. It does not appear that Laverne and George had any other children. 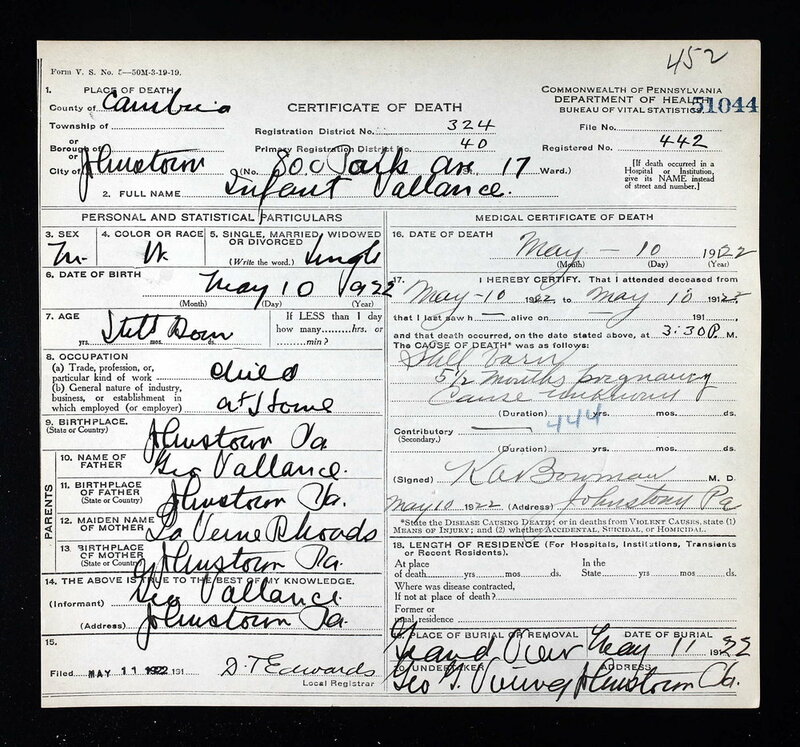 George died in 1935 and on the 1940 census Laverne and her mother Jennie, both now widowed, were the only occupants of 800 Park Avenue in Johnstown, PA.
Laverne died in 1962. Here is her obituary in the Johnstown Tribune Democrat on June 21, 1962. Laverne is buried at Grandview Cemetery in Johnstown, along with many in her family. Next to her, in "Highland 3 lot 307", there is a shared grave, simple and poignantly marked "Vallance Babies". Your Storied Life: Pocket Portrait of Laverne Rhoads Vallance (1899-1962) was adapted from an earlier post.